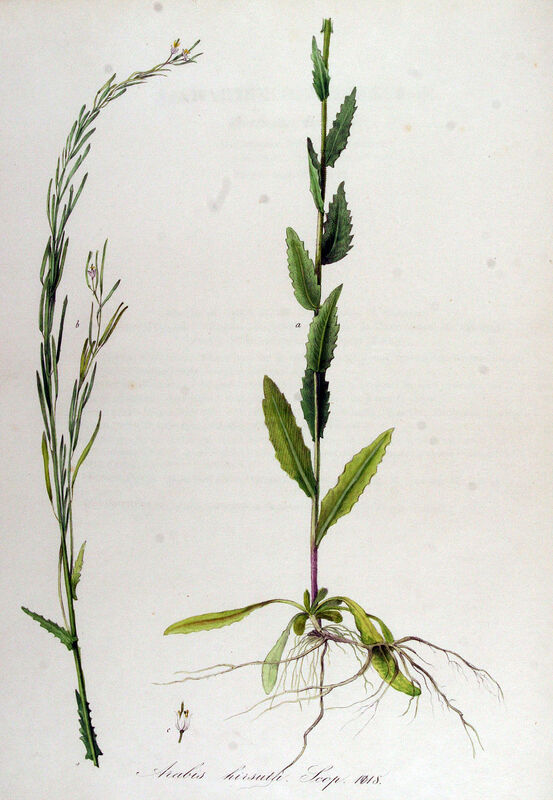 Arabis hirsuta var. pycnocarpa is a biennial or short-lived perennial herb, to 80 cm tall, hairy. Leaves alternate on flowering stem, to 3 cm long, numerous, lance-shaped, stalkless, lower ones clasping stem, hairy on both sides, basal rosette leaves to 8 cm, wider, with a stalk. Flowers white to yellowish, petals 4, to 0.6 cm long, 0.1 cm wide, May-June. Fruit dry, capsules, flat, to 5 cm long, 0.1 cm wide, seeds in one row, often winged. Habitat: Open areas, cliffs, ledges, on calcareous to circumneutral soils. Notes: Arabis species are host to the larvae of the falcate orangetip butterfly, Anthocharis midea Pieridae (Pyle 1981).